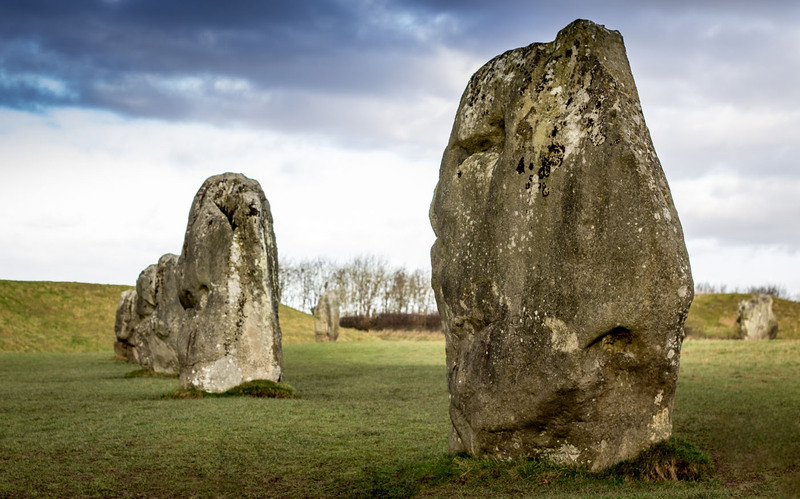 A sense of awe and mystery surrounds the great henge at Avebury which forms part of the same World Heritage Site as Stonehenge. The circles erected some 4,500 years ago originally contained up to 175 standing stones arranged in an outer circle and two inner circles, surrounded by a massive ditch and bank. It is the focal point of an amazing group of ancient monuments and the source of the massive Sarsen stones which were transported across the downs to be used in the construction of its better known sister monument, Stonehenge. Significant destruction occurred in the Medieval and Victorian periods when stones were broken up for use in other buildings or toppled and buried in pits dug alongside them. Many of these buried stones were restored to their original positions by Alexander Keiller, a wealthy amateur archaeologist, who purchased the Avebury Estate in the early 1920s. The ability to wander within the stones, to touch and examine them without hindrance, other than from grazing sheep, creates a magical and unforgettable experience. Then, if time permits, follow the route of a partially restored avenue of 200 stones to the Sanctuary. Visit the West Kennet Long Barrow, Britain’s largest and most sophisticated chambered burial tomb and be amazed with the view of the giant mound of Silbury Hill, the largest man made mound in Europe whose purpose, despite many excavations, remains a complete mystery. In the village, part of which is actually within the stone circle, you can visit the Alexander Keiller Museum, Avebury Manor and Gardens, the Parish Church or take a beverage in the Red Lion Inn which is haunted to this day by a former landlady. Why was the stone circle desecrated and subsequently partially restored? What is supposedly hidden within the great mound of Silbury? What happened to the pub landlady?